Woodie is a pit bull that was found weeks after being born with two severed legs but now, he’s getting prosthetics. NBC 5's Anayeli Ruiz has the details. Woodie is a pit bull that was found weeks after being born with two severed legs but now, he’s getting prosthetics. At first glance, he seems like an unstoppable puppy full of life but if you take a closer look, you’ll notice he has something out of the ordinary. They believe an animal might have harmed Woodie. A local rescue grouped picked him and sent him home with Jenn and David Grelck who were originally just going to foster him for a while. Woodie quickly warmed up to them until they finally decided to adopt him. 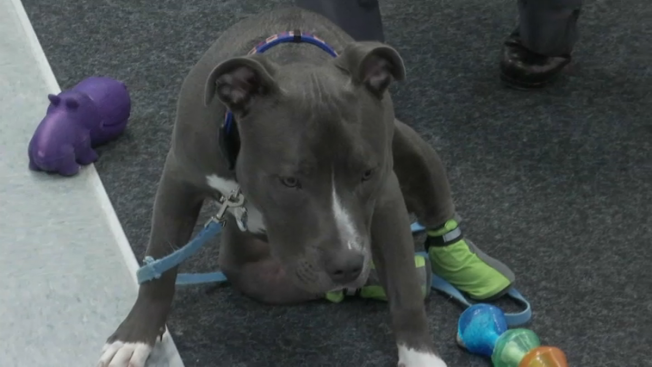 The family wanted to make sure Woodie had a chance to live and play like any other dog, so they contacted the Joliet Junior College to see if they could help make him a prosthetic legs. Professor Mike Brncick is a part of the Orthotic Prosthetic Program and said he jumped on the idea and specialists performed some surgeries on Woodie for free; students are volunteering their time to make him some prosthetics legs. Woodie has to be thirteen months before he can get his prosthetic legs. In the meantime, he will be wearing sleeves to protect them. The wonder puppy has already helped teach the family a valuable life lesson. “You can pretty much overcome anything giving a little time and a little hard work and good effort by a lot of people involved,” said David Grelck. His parents say they will share this lesson with others by visiting kids in hospitals or schools and engage with those in special needs.